We are not big car guys in the sense that we don’t all excited about the cars themselves. We are, however, big car tech/gadgets guys. Which is why, over the years, our project car has accumulated a fair number of gadgets…enough that we had to keep finding new power taps to ensure sure we didn’t over stress the line that powers the cigarette lighter! Things are getting a little crowded up at the top! Not so much that they are an obstruction, but enough that running all the wires around the frame has been challenging. 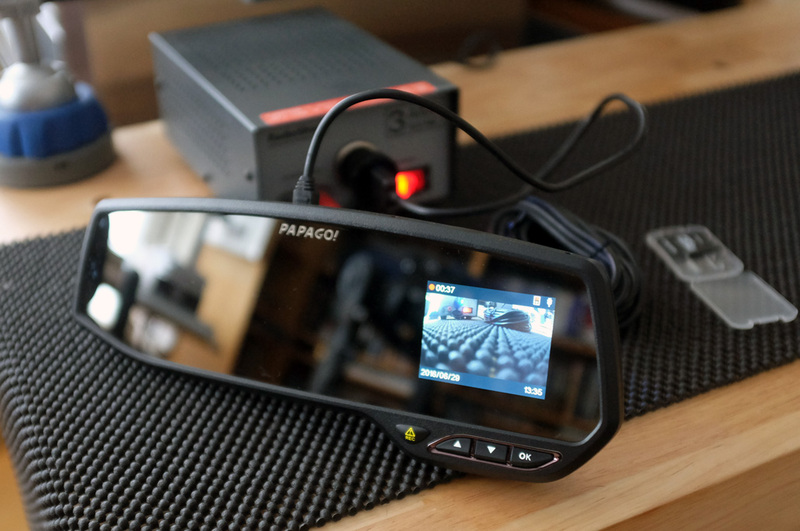 We hoped that there would be an integration of the various devices into a more streamlined “super gadget,” and have mentioned this wish to some of the dashcam folks in the past. Well, PAPAGO! 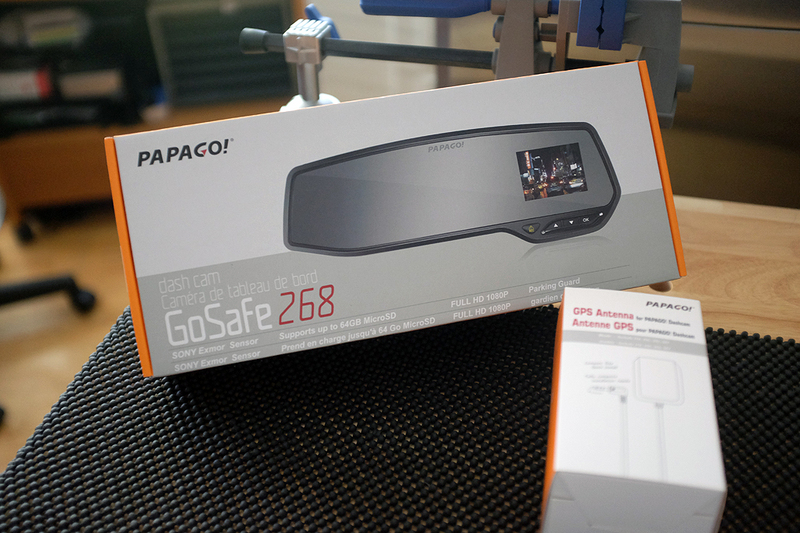 has taken a step in that direction with their new GoSafe268. Everything needed was included in the kit: Mirror/dashcam, USB power cord/power adapter, 8GB micro-flash/CF adapter, and direction booklet. As everything has been integrated into the mirror (except the direction booklet, of course), so no assembly is required. The mirror itself is surprisingly thin, even with the dashcam module on the back. 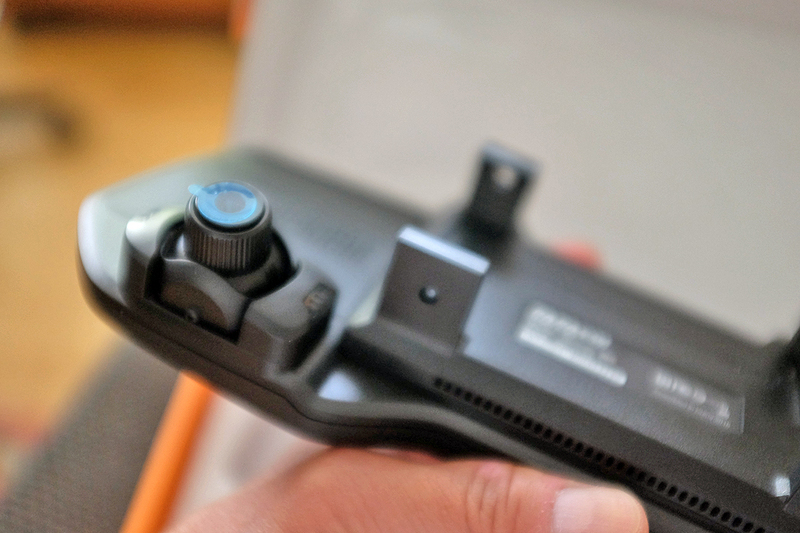 All the controls are located on the right side of the unit: the LCD display and buttons are on side of the mirror, and the gimbal-mounted camera lens is on the back. 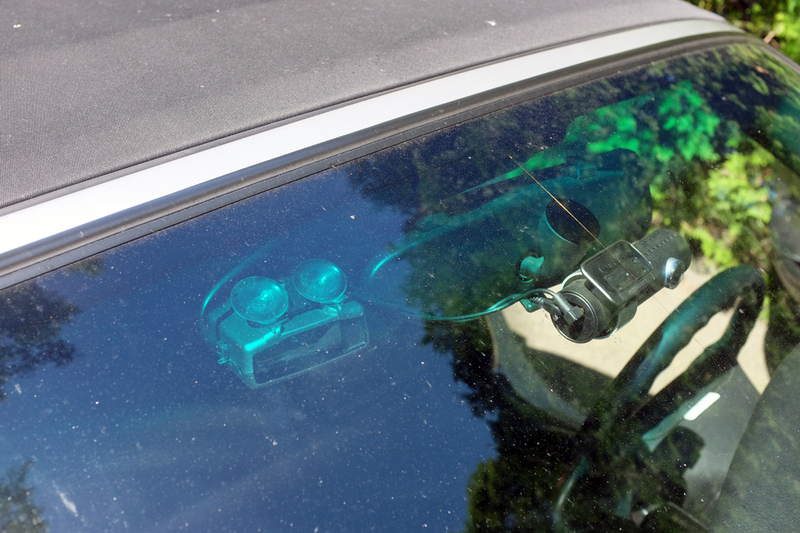 Two large, spring-loaded clamps grab onto the existing rearview mirror. Installation should be quick and removal just as simple. It is not going to get any easier than this! With the exception of the Power button, all of the controls are in the front. The Up/Down/OK buttons are context sensitive and self-explanatory. We’ll have more on their usability in the FirstUse report. We did notice that the buttons were nicely sculpted with a nice curve up rather then just flat. Ergonomically speaking, this is a nice touch. When the unit is powered on for the first time, the Setup Screen comes on automatically to get the info it needs: date, time, etc. Adding a GPS antenna will add speed and location info to the mix, and it will be interesting to know if it will self-correct the time. We’ll have to remember to look and see. 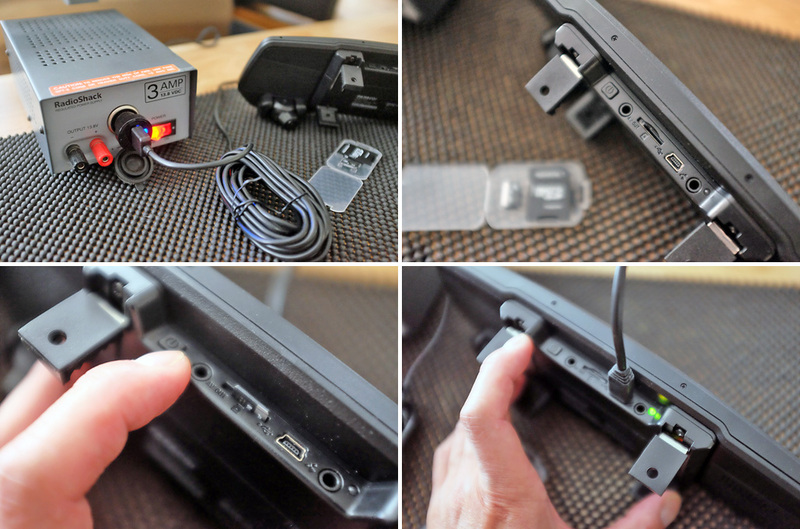 Along with the few things we have already mentioned that we plan to check is the concern we have regarding how high the USB connector sticks up into the air. We are hoping it will not be a problem inside the car when the convertible top is up! 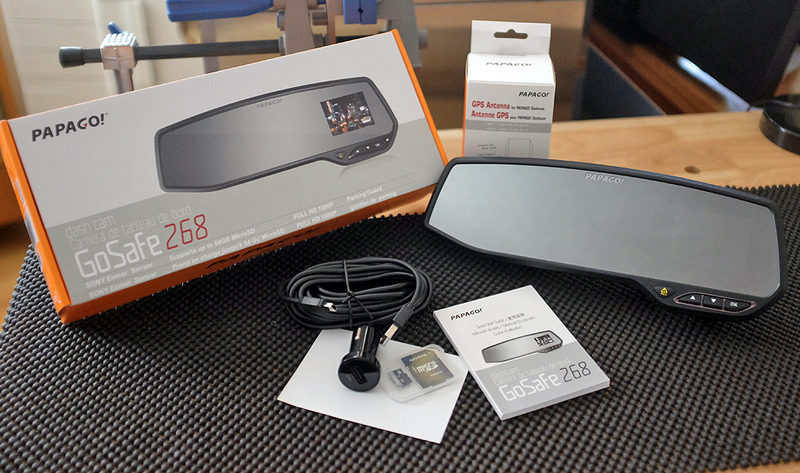 We’ll have the Installation and FirstLook write-up along with how the GoSafe 268 compares to the Blackvue dashcam later in the Summer. Drive safely and look out for cyclists!! !